I’m not sure when I first realized the difference between people who are in your life and people who impact it. Maybe it’s when I left all those people behind. One of my biggest struggles in moving to a new country has been finding kindred spirits. And, as I’m a bit of an odd ball, finding someone as bizarre and prone to spontaneous misadventures as I am seems a little like combing through a huge china cabinet looking for the plastic sippy-cup – it should be easy to spot, but you feel like it probably just isn’t in there. Like Anne Shirley’s, my dramatized aspirations of adventure and romance are less romantically dramatic in real life than in my daydreams. And if coming to Prague was anything like Anne moving to Green Gables, I passed the part where she imagines castles and silver lakes and now I’m stuck in a town where people tug on my braids and get upset when I accidentally drug their children with current wine (to make this even more authentic a metaphor, people make their own current jam here!). Why do we build up palaces in our minds when we know that real people live in houses? I can say for certain, however, that I’ve never day-dreamed about England. I never once wished to go visit. Ireland, Scotland, even Wales – yes, but never England. And I wondered why as I sat in blissful excitement on a bus from Heathrow to Oxford at 10 p.m. last Friday. Was it because I assumed that it would never be as good as the stories? Maybe. All I know is that the gentleman next to me leaned over and asked if I was alright with quizzical concern so my excitement must have been obvious. I had to tell him this was my first time in England and he nodded delicately and went back to his paper. England lived up to every expectation I never had. I spent Saturday with an old friend who is studying in Oxford. Some of his friends let me crash on the couch in their flat for Friday and Saturday night (incredibly kind considering they don’t know me from Adam). 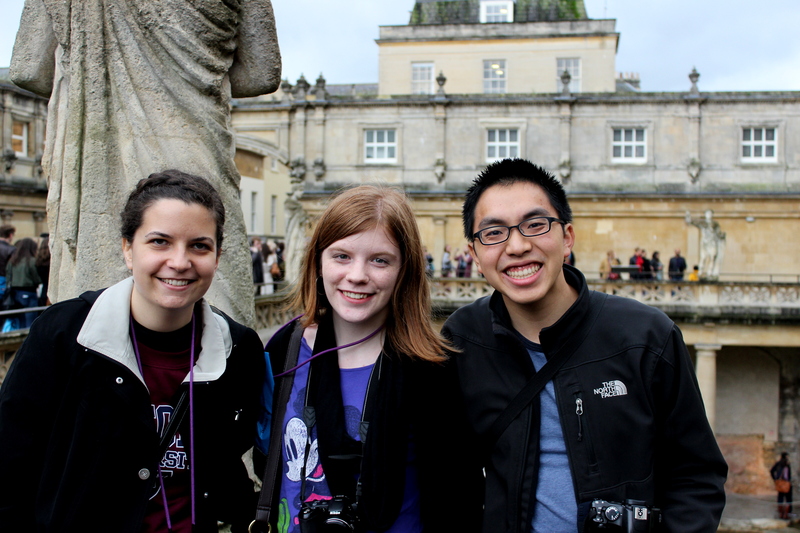 A few of them came to Bath and Stonehenge with us the next day. We spent nearly 4 hours on the bus asking questions like, “If you could turn a fruit or vegetable into a human and give it a name and occupation, what would it be?” Smells of Cornish pasties and fresh grass followed us from one wet corner of England to the next. Laughing about third wheels, Roman curse tablets and a male street performer dressed in a pink tutu, we tripped in and out of tea houses, stone alleyways and a very friendly pub called The King’s Arm. At last, time slipped away from us completely and we said goodbye. Knowing someone for only a day is a strange thing when your heart says you should know them for much longer. Some kindred spirits in Bath, UK. I fell asleep on their couch, but was up again before the sun to find the Oxford bus station and make my way to Canterbury. And by ‘before the sun’ I mean the ripe hour of 5:30 a.m. (if anyone questions my dedication to get to a church service on time, I just want them to think about that). A bus and a train ride later, I stepped onto a platform in sunny (as sunny as it gets in England) Whitstable, straight into the gaze of a very good friend. “You made it!” she said, with a wispiness in her voice that makes her sound like a fairy. “Always a tone of surprise with you, Julie” I chided her lovingly. This is justified. Anytime I make it anywhere on time and in one piece a little surprise is warranted. She wrapped me into a hug and my three hour commute washed away. “It’s good to see you,” she whispered. Yes. So good. So good to be back with someone who happily tolerates, if not appreciates, my explosions of personality and dumb sense of humor (Q: What do British Sea Monsters eat? A: Fish and Ships!). I spent four days in Kent with Julie and the couple she is living with. I’d like to describe them to you but I just don’t know if I can. Do a dictionary.com search for ‘hospitality’ and you’ll be at the starting line. Home-cooked meals, sit-down breakfasts, a bed with fluffy pillows and a never-ending stream of tea and coffee, and all of this doesn’t compare to how good it feels to sit down with people who laugh at the same things you find funny. Or, equally potent, finding someone who likes the same wallpaper patterns as you. I’m going to take a moment here to personally – and indirectly – thank them for the food they prepared all week. I’m sure they would say it was no trouble, but it meant a lot to me, especially when they made Shepherd’s pie specifically because I requested it. Cooking a meal takes time and is one of the most underappreciated forms of showing love. Also, British cooking is as close to what I eat at home as I’ve had in four months so it spoke sweetly to my soul. Thank you. On Tuesday, Julie and I spent the day in Whitstable with a mutual friend from the Czech Republic. We were three foreigners on the English coastline – one for studies, one for business, one for pleasure. We had proper fish and chips, collected seashells, took shameless tourist photos with dead fish in the market and sampled the best donut to have ever christened the earth with its presence. Then we walked for miles along the shore, laughing and talking about nothing. I think that’s the defining marker of bosom friends – being able to talk about nothing like it’s the most interesting something you’ve ever heard. 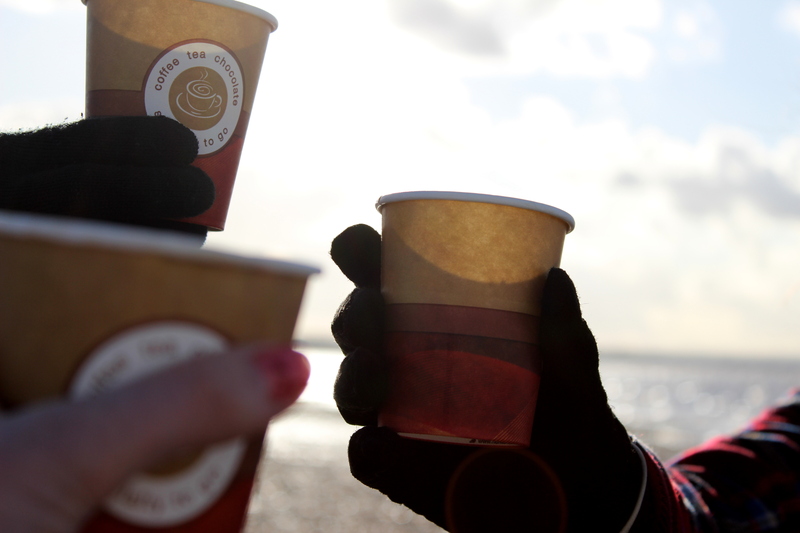 Coffee and the British Coast. Cheers, then. On Wednesday, Julie and my hosts took me to London where we met up with another friend, Georgina – a proper Brit who is about as real a person as they come. As we waited in line to store my suitcase at the Victoria Train Station Luggage Hold, they asked if there was anything specific I wanted to do that day. And so we trooped. From one glistening monument to the next, we meandered slowly. 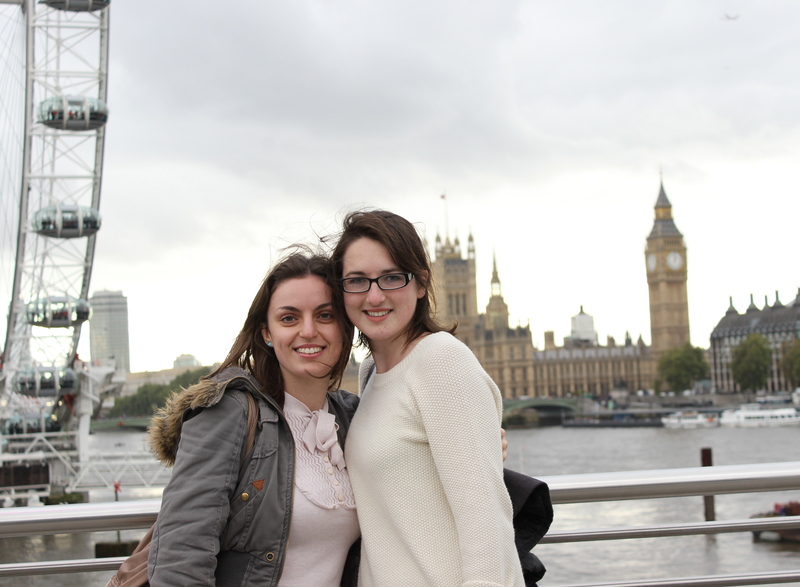 Georgie showed us around the city – a native Londoner! We stopped to take a thousand pictures at least, laughing at the bad ones and promising to post the other two to facebook. London, in proper British fashion, is incredibly tidy for such a large city. I was impressed. And I was surprised. It was helpful that I had absolutely no expectations because everything just became wonderful. Georgie Porgie and our London view. We finished our touring and my companions took me all the way to the airport (about 40 minutes out of the way) and then stayed with me until I got checked in. “Let’s have a cup of coffee before you have to go to your gate,” my lovely hosts suggested. So we sat down for coffee and hot chocolate and they produced a paper baggy for me. Inside was a Cornish pasty. “We got it for you when we went back to get your suitcase at Victoria,” they told me. Anne Shirley had huge dreams about life, but in the end her greatest adventures and most meaningful memories came from the people she loved. I hope the world sweeps me away to a thousand places, but I hope it always carries me back to Green Gables. 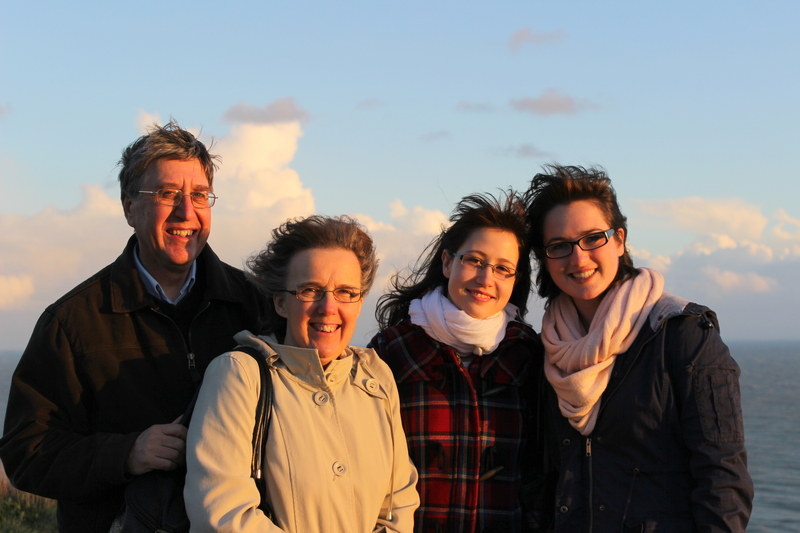 A tiny piece of Green Gables on the Dover cliffs with these wonderful people. This entry was tagged Anne of Green Gables, Anne Shirley, Czech Republic, England, good friends, hospitality, kindred spirits, London, travel. Bookmark the permalink.